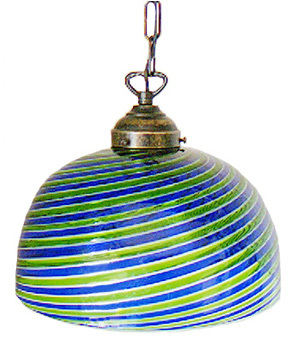 Murano glass lamp made of blue and green Zanfirico glass, this 8 1/2 inches tall by 8 1/2 inches wide hanging lamp is as beautiful as it is difficult to create. The lamp comes complete with a 2 foot chain ready for installation. The lamp shade can be removed and fit on somes styles of standing lamps.